Why our process is better, Most engineers We Have Dealt with Have always complained about the poor quality components and finish by anodized companies, "patches", "comet tails" and clamping marks, as well as poor color saturation. So we set about designing a service around Specific needs. We do not get Involved with high volume demands . The first part of the process is to determine an exact surface area of the part to be anodised. This will ensure that the anodic layer is exactly the right thickness and the pore size is the correct size to receive and retain any dye. We do this by drawing the component in cad . If you can supply a cad model (preferably Solidworks) then this will save us the hassle and reduce costs. 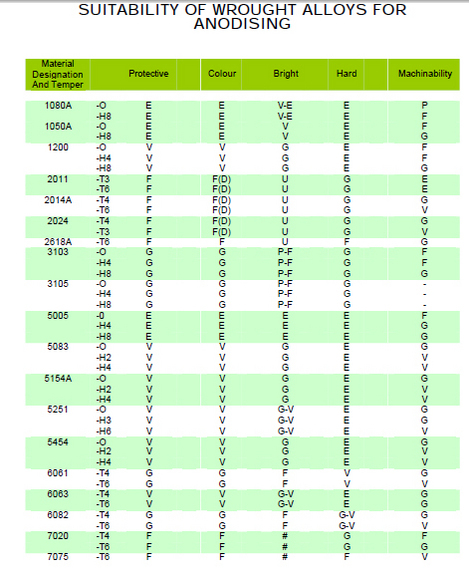 Below is a chart showing how different alloys anodise.